This post has been compensated by Karuna Beverages, a long term partner of Vegan With Curves. All opinions are mine alone. This coconut vegan chickpea curry is both comforting and healthy. Made in a base of vegetable broth, creamy coconut milk, and severed with fresh tomato soup. Chickpeas (Garbanzo Beans), are one of those curvy vegan pantry staples to have. 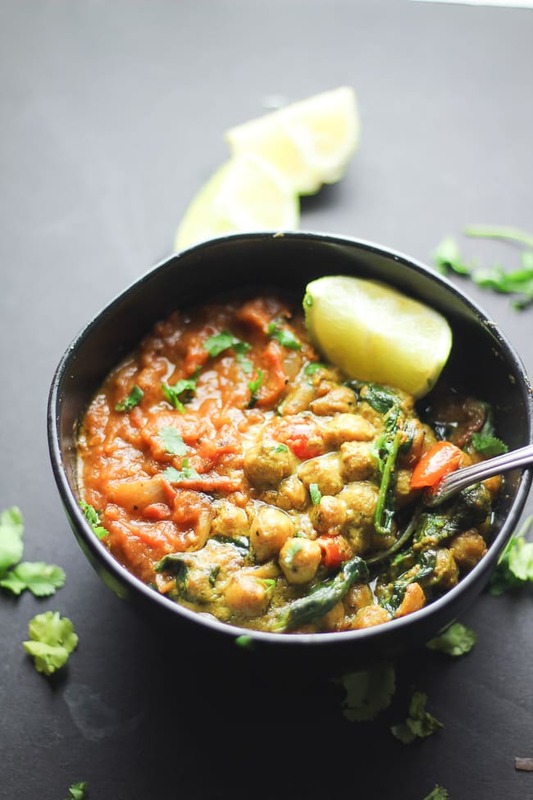 Not only are they high in plant based protein but they are inexpensive and their texture makes them the PERFECT ingredient for vegan curry recipes! A spice blend known as Curry Powder. Depending on the region, curry powder is a mixture of spices with typically the base being coriander, cumin, and turmeric. A generic term for dishes flavored with curry powder or curry paste (like this recipe). Usually with the combination of protein, other vegetables, and coconut milk. To read more about curry and where that term originated from, check out Why Shouldn’t You Ask an Indian for Curry? How to Thicken Vegan Chickpea Curry? There are many ways to thicken vegan chickpea curry. Coconut Milk/Cream. This is my preferred method. I find with just the right amount of vegetable broth and coconut milk, chickpea curry thickens perfectly. Flour/Starch. This is the most tried and true method. Flours and starches (corn starch, tapioca starch, etc) are know thicken agents. If you want to use a flour I recommend using chickpea flour or corn starch. I would caution against tapioca starch as it can cause your curry to be “gooey”. Yuck! Potatoes. Not many people realize this but adding potatoes to your curry (especially sweet potatoes) not only makes the dish more filling, but the starch can help thicken it. I use this in my Red Chickpea Curry recipe in my 28 Day Vegan With Curves Meal Plan Guide and it worked perfectly! How to Serve Vegan Chickpea Curry? Tomato soup like in this recipe! This tomato soup recipe is the perfect compliment to this chickpea curry dish. The tartness of the tomatoes helps balance the spices in the Coconut Chickpea Curry. I used fresh tomatoes, herbs and Karuna’s Watermelon Whole Plant Tonic Juice. The natural tartness of this juice pairs perfectly with the fresh tomatoes. 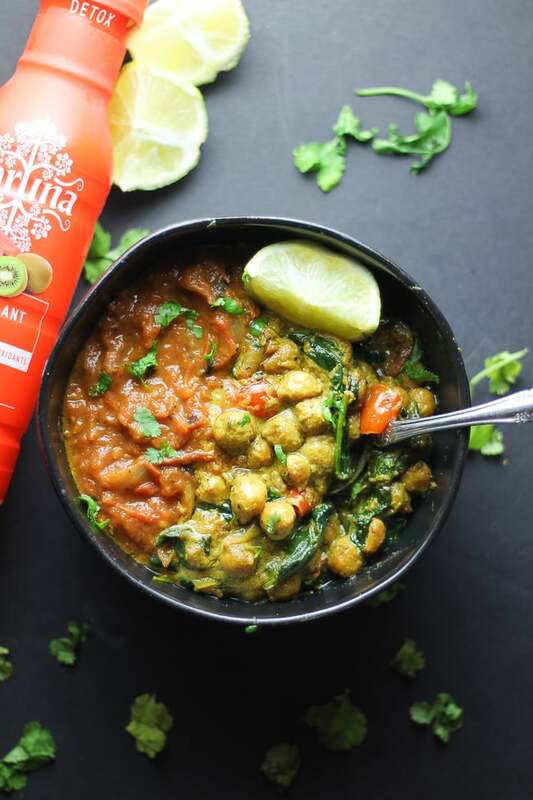 How to Make this Vegan Chickpea Curry Recipe? Add avocado slices for additional calories for us curvy builders. Plus avocado just taste really well with this dish! Even though the squeeze lime is optional, I highly recommend it. It really brings out the flavor of this chickpea curry. Don’t like chickpeas? Try this vegan curry recipe with lentils, tofu, jackfruit, cauliflower, or sweet potatoes! You can use a store bought curry powder if you don’t have all the individual spices. Depending on the one you buy it might not have a bright yellow color in like using turmeric powder. How do I meal prep this? This vegan chickpea curry and tomato soup will keep in the refrigerator for 3 to 4 days. Use a meal prep containers with 2 compartments, putting you chickpea curry in on slot and tomato soup in another. This will help you save room on storage. Does it freeze? This vegan chickpea and tomato soup can be frozen for up to 1 month. Freeze them in separate bags and containers. Chickpeas (Garbanzo Beans) are the Vegan With Curves star ingredient of this recipe. One cup of chickpeas has 15 grams of plant based protein and 45 grams of “curvy” carbohydrates. You can use cauliflower instead of chickpeas to lower your calories. Don’t omit the coconut milk! That adds the creaminess. Instead use low fat can coconut milk instead. Serving this with tomato soup helps keeps the calories low as well so that’s a win win! This is a staple recipe of mine. It’s so affordable and you can mix and match ingredients to your liking. Enjoy! This coconut vegan chickpea curry is both hearty and healthy. Made in a base of vegetable broth, creamy coconut milk, and severed with fresh tomato soup. Once every thing is done roasting, add your tomatoes and onions over to a medium size pot. Then add vegetable broth (stock), Karuna's Whole Plant Tonic Juice, and dried basil to your pot. Simmer the vegan chickpea curry for about 10 - 15 minutes till liquid in the skillet has reduced and thicken. If you don't have an Immersion Blender, transfer mixture to a high speed blender and blend until smooth. Then transfer back to your pot and continue with the remaining steps. This post has been compensated by Karuna Beverages, a long term partner of Vegan With Curves. All opinions are mine alone. Thank you Karuna for helping me create this recipe!